After being swamped by people for several weeks, we found two cities that were wonderfully un-touristy: Zigong and Yibin. While this came with its own problems (such as a lack of restaurants and hostel workers that spoke English), it was a great break from claustrophobia and we fully enjoyed it. 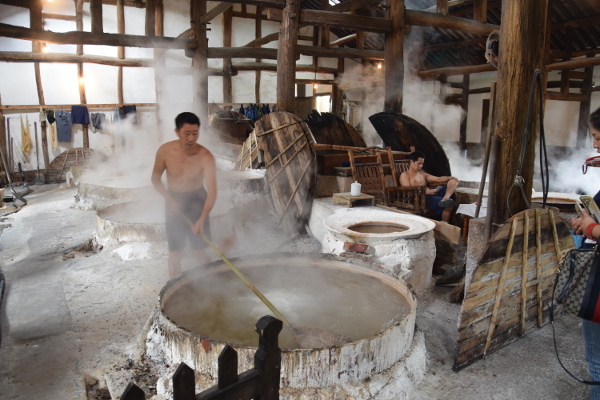 We spent only a day and a half in Zigong but we only had two big stops in mind: the dinosaur museum and the salt museum coupled with a visit to a functioning salt well. For whatever reason, I have lived my life so far without putting much thought into how salt is produced or even where it comes from. This lack of concern surprises me because I vividly remember a series of middle school research projects in which I grew salt crystals on a string and compared the molecular structure to the crystal structure. I also remember that salt played a large role in the peaceful protests in India, something I learned while researching Ghandi for another school project. I had assumed, therefore, that I had thought a bit more about salt than most people. It quickly became clear, though, that I knew nothing about salt production. I had a vague notion that it might come from the sea, using some kind of evaporation method to leave the salt crystals behind, but that was as far as my thought process had reached. Imagine my surprise, when I found out that you can drill for salt! Fundamentally all that is needed to begin the salt production process is salt brine, which can be found at a variety of different depths in the earth’s crust. 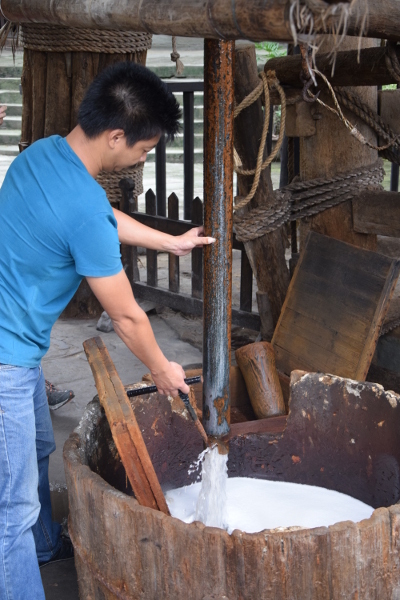 Zigong was historically one of China’s most profitable salt production areas and houses the world’s deepest hand-drilled well. Amazingly, this well is still being used today. A visit to the well provides some good pictures of some poor men who must be sweltering in the constant heat of the boiling brine pools, and (if you pay extra) a demonstration of the well at work. This is still impressive even though today it works with a generator, rather than the oxen as used previously. 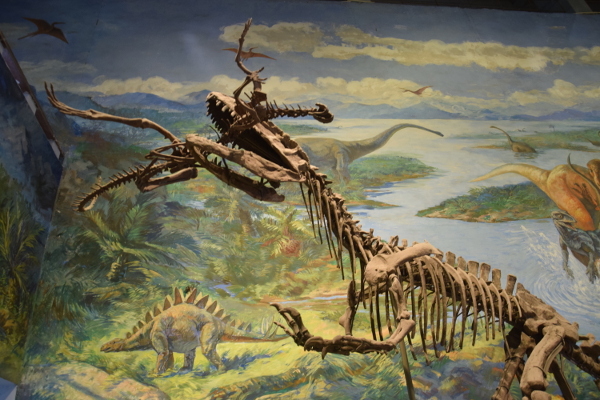 The second stop in Zigong was the dinosaur museum. 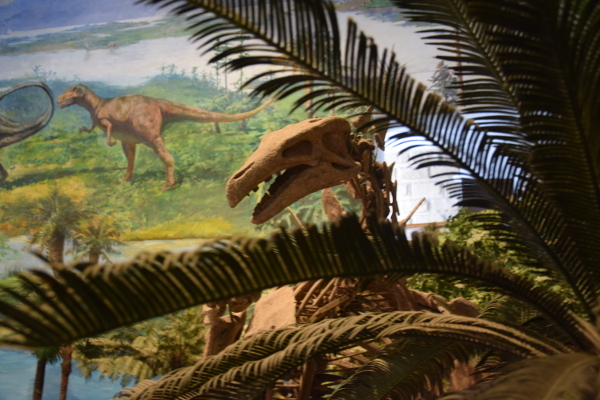 The salt museum speculated that there was some connection between profitable salt areas and dinosaur fossils- apart from being an area rich with salt, this area is famous for its many species of dinosaurs and well preserved skeletons. Whether or not there is any scientific merit to this hypothesis, this dinosaur museum is large, well developed and wonderful. From the distance you see the curved building, adorned with its own spikes to make it look vaguely like a dinosaur itself. Inside the gates you find models lurking amongst a plant garden filled with ferns, and then you get to wander through a variety of halls that display dinosaurs in different ways. First, and most impressive for the photos, was the room full of skeletons strung together to give an idea of the shape and size of the animals. These were then put into different poses to create small scenarios. In the following room large amounts of earth had been transported in and you could admire the skeletons still in the ground, only partially revealed by the work of scientists. Here you got an impression of how difficult the work must be; often there were several skeletons virtually on top of each other and twisted into unnatural shapes. Finally, the last room housed a variety of smaller exhibits, including the skeletons of small animals with bones so delicate that they look like paintings on the rock and fossilized plants and eggs. Very happy with having learned quite a few new things, we ordered ‘not spicy’ noodles without knowing what else was in them and prepared for the next stop on the tourist-free destination list: Yibin.